Explore the best drum set for kids. I’ll show you the best junior acoustic and electronic drum sets for 5 and 10 year olds and even a drum set for toddlers. With so many drum sets on the market it can be a bit overwhelming choosing the right size kit for a child. In this article I'll show you the best drum set for kids for every age bracket. 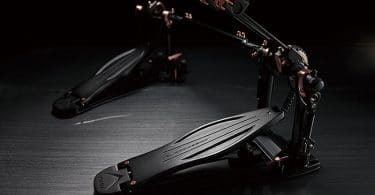 The best part is that most of these come with everything you need including stands, seats, pedals, and even drumsticks! Why Should I Buy My Kid A Drum Set? If you are hesitant about letting your child learn drums by buying them a drum set, you might want to reconsider. There are numerous documented benefits for learning how to play drums, especially in children whose brains are still developing. Drumming has been shown to increase math skills and logical thinking. Not only do students learn multiplication tables and math formulas easier, but those who learn rhythm notations were found to score 100 percent higher on tests involving fractions. 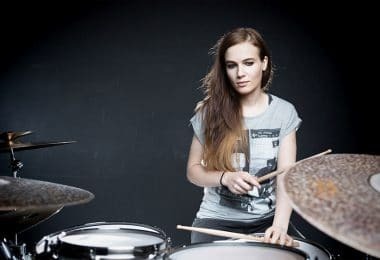 In addition, learn things like English is notably easier in drummers due to their ability to pick up on emotional cues and use that to identify characters’ thought processes. Just like running or working out releases feel-good endorphins into your system, so does drumming. 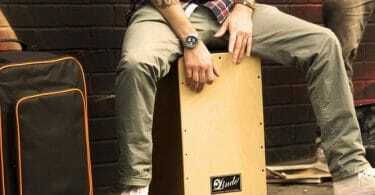 University of Oxford psychologist Robin Dunbar found that just listening to music had no effect, but the act of physically playing an instrument like drums is what releases the endorphins. There are numerous health benefits to this including boosting your mood and relieving frustration, disappointment, and stress. According to the study done by E. Glenn Shallenberg at the University of Toronto, IQ test scores of 6-year-old children significantly improved after receiving drum lessons. Constantly being exposed to reading music and learning how to understand rhythms can measurably increase ones IQ level. When you play drums you are also forced to use your non-dominant hands and feet. Utilizing all 4 limbs at once kicks your brain into overdrive and new neural pathways are created. What Age Should Children Start Drumming? As early as possible! There is lots of research showing a specific “prime time” to learn an instrument, and that is between birth and age 9. During this time, the mental structures and mechanisms associated with processing and understanding music are in the prime stages of development, making it very important to expose children in this age range to music. I was lucky enough to start drumming very early on in my childhood, however I waited until just recently to try learning guitar. It’s definitely achievable, but it doesn’t come close to the ease and speed at which I was able to learn drumming as a child so I wholeheartedly agree with this testament. Full Size Or Junior Drum Set? Depending on how big they are, you should consider which size to go with. If you go with a full size drum kit and your kid is too small, they won’t be able to reach the pedals or reach up high enough to hit the cymbals. It’s best to go with a junior drum set in most cases because they can also be played by full-grown adults. They will also be much cheaper and take up less space wherever you put it. If the child is a bit older or you think they are big enough to handle a full size drum set then I’d say go for it! When buying a drum set for kids it’s always great to have an option of getting an all-in-one package. Not having to worry about figuring out what cymbal stands and bass drum pedals to get can be a huge relief. 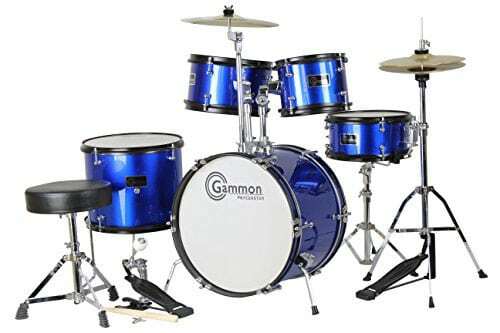 The Gammon Junior Drum Kit is a best-seller that comes with everything you need for your kid to get up and running in no time, and it’s also extremely affordable. It’s smaller size makes it easy for smaller children to play on, and it’s a good intro to drumming. The cymbals and hardware obviously aren’t going to be amazing sounding, but it’s a great stepping stone before upgrading later on when they really show interest in continuing. With this kids drum kit you’ll get a 16” bass drum, 3 toms, a snare, hi-hat, crash cymbal, stands for everything, a drum key, sticks, stool, and a bass drum pedal. It really is everything you need, so they should be set for a few years to come. The shells are made of real wood, and the sound is much better than other junior drum sets on the market. At around 10 years old and up, it’s a good idea to go with a full size drum kit and pick a decent quality one since it will most likely be played for many years. 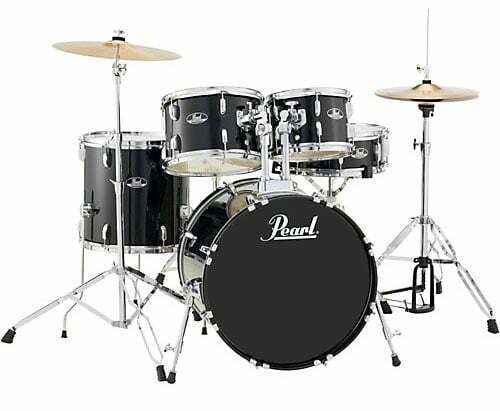 One of the highest reviewed and best drum sets in this category is the Pearl Roadshow. And the best part? It comes with all hardware so you don’t need to buy anything extra. For a really affordable price you’ll get a 22x16 Bass Drum, 1x8 Tom, 12x9 Tom, 16x16 Floor Tom, 14x5.5 Snare Drum, 16" Brass Crash-Ride, 14" Hybrid Hi-Hats, stands for everything, a bass drum pedal, and a drum throne. This is a great kit that can become the foundation for your young drummer for a large part of their life. It’s always good to start with something cheap, and then they can slowly upgrade different parts as they find what kind of things they like when it comes to things like cymbals or drum heads. Want to see some other options? Check out our round-up of the best cheap drum sets. If you are looking for the best drum set for kids that is portable and with the ability to be played quietly, an electronic drum set is the perfect solution. It can make for a great kids drum set. 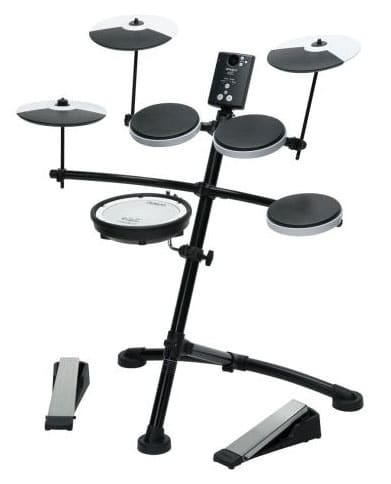 The Roland TD-1KV is my choice for best electronic drum set for kids, and it’s made by one of the leading manufacturers of electronic drum sets. 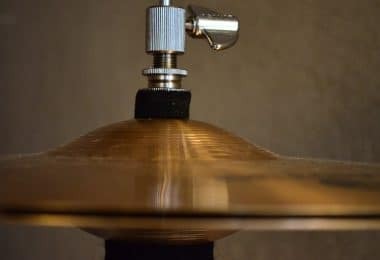 Basically in place of the drums and cymbals are rubber pads, and they feed into the drum module which can then run out to speakers or be hooked into with headphones for silent drumming at all hours of the night. A big plus of electronic drum kits is that you can hook them up to your computer via MIDI cable to trigger drum software with thousands of professionally recorded sounds. You can also read our guide on how to connect electronic drums to a computer. The module is jam-packed with 15 different drum kits, plus an onboard Coach function, metronome, and recorder. On top of that you can hook in your own music to play along with or jam along with one of the included tracks. Just because a child might not be big enough for a real drum set doesn’t mean they should be left behind when learning how to play a rhythm. In fact, the earlier you can get them involved with playing musical instruments the better since that is the time that their brain will soak it up the most. 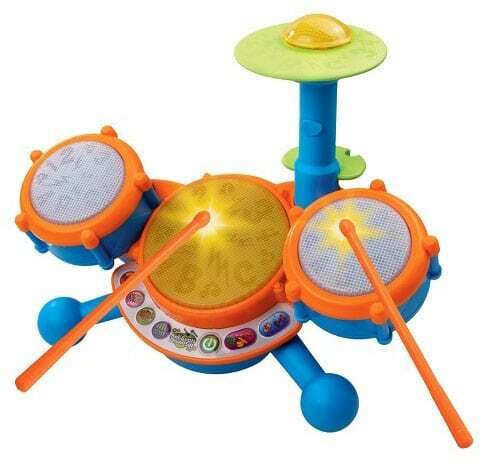 The VTech KidiBeats Drum Set is geared towards ages 2-5 years old. 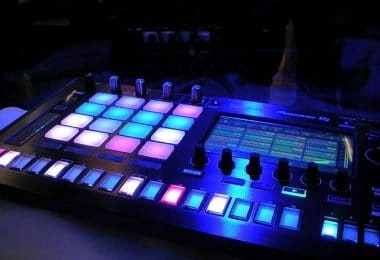 It features 4 different pads to hit while they freestyle or play along with nine different included melodies. There are even numbers and letters that light up on the drums so they can learn while they play. It even comes with a pair of drumsticks so you don’t need to worry about buying anything extra! One thing that might be holding you back from buying a drum set for your kid is the fact that drums are LOUD. Luckily there are a few good solutions for this. Electronic drums are a luxury that weren’t around until just a few years ago. 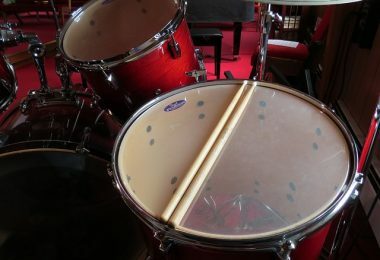 With the ability to play through headphones, it’s the ultimate way to practice on a full drum set silently without annoying the neighbors (or parents). On top of that, most drum modules come with training programs and the huge variety of sounds available will keep their interest way more than just using a simple practice pad. If this kind of thing was available when I was a kid, I think my parents would have paid a fortune for it just to not have to hear me practice! When it comes to drums for kids, electronic kits are a great low-noise option. To see a big overview of some different options check out our article on Roland electronic drum set reviews. Mute packs are essentially thick dampening pads that are placed on all the drums and cymbals on an acoustic drum set. It creates very little sound when played, but you still get some of the character of the drum softly coming through underneath. It’s how I used to play sometimes when growing up and I thought it was a great way to learn without annoying everybody around me. I’d recommend getting the Vic Firth MUTEPP6 Drum and Cymbal Mute Pack for this. It comes in a large variety of sizes and includes a bunch of pads for both drums and cymbals and it gets the job done perfectly. Not Ready To Start Them On A Drum Set? 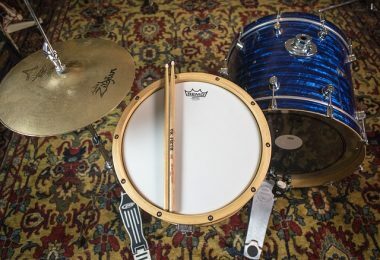 Playing on just a snare drum is the most common way that children start learning drums, so if you aren’t ready to commit to a full drum set then this is the way to go. Check out our article on the best snare drums to find some good options including beginner student snares. What’s The Best Way For Kids To Learn Drums? The number one way for anybody to learn drums has been, and will continue to be with a real teacher. You just can’t replace a live person sitting next to you helping to fix your posture, technique, and playing. I’d highly suggest signing them up for the school band programs if available, and even taking private lessons if you can afford it. If you want to go the free route, YouTube is a great resource for learning drumming nowadays. You can also just google “free drum lessons” and be bombarded with tons of sites out their offering some free material. The problem with the free YouTube approach is that it’s hard to know where to begin and what order to go in. In addition to that, you can’t be sure the person providing the lesson is trustworthy and knowledgeable. For pretty much any age, you'll be able to find a suitable kids drum set. With advanced in technology, the types of sounds they'll be able to play are pretty much limitless, and that will fuel them to play more and more. If acoustic conditions permit it though, get them a real junior drum set! There's something much more satisfying and primal from hitting a real drum rather than an electronic drum pad. It's never too early to start, and once you see them having fun and learning you'll wish you started them on a drum set sooner. I hope that this article helped guide you to finding the very best drum sets for kids, and don't hesitate to reach out to us if you have any questions!